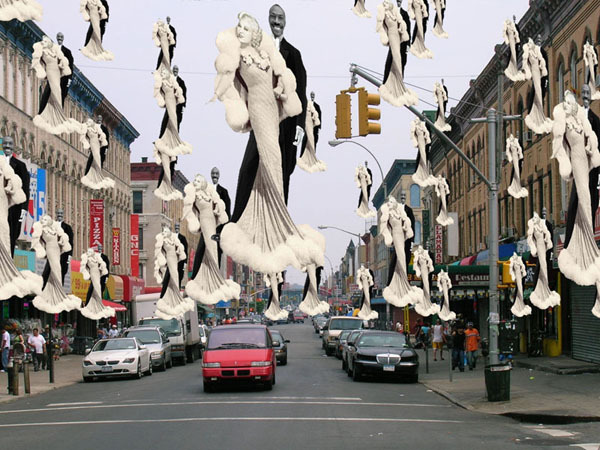 "Eddie Murphy and Mae West: Return to Bushwick"
"Seven Portraits for Maria Hernandez"
The artworks are available for view indefinitely. To see the artworks you need to have an iPhone or Android smartphone, and install the LAYAR augmented reality app to view the artworks, and of course need to be physically present at the location in Bushwick to see them in place (see exhibition map and information). Maria Hernandez was a Bushwick activist murdered for her fight to free the area of drug use. In 1989 Bushwick Park was renamed “Maria Hernandez Park” to commemorate her memory, but I could not find any image of her on the Internet. 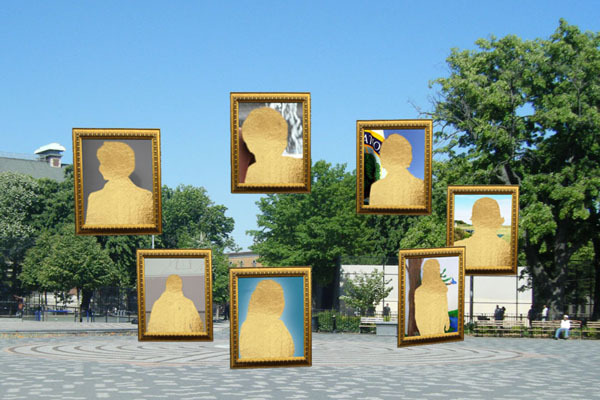 This artwork uses 7 photos of various women named “Maria Hernandez,” taken randomly from the Internet and anonymized as inverse gold icons, to commemorate this “invisible” activist.